Leistritz Pumps Business prides itself on excellent after-sales service and support. We cover all of the products that we sell with start-up services, technical assistance, spare parts and repairs. Pumps can be repaired in any of our local authorized service facilities or our team of highly qualified Service Technicians can travel to your site. We also offer technical training as well as on-site proactive evaluations anywhere in the world to insure your equipment is always operating at peak performance. Modern machine tools require expert handling in order to achieve highly efficient results. 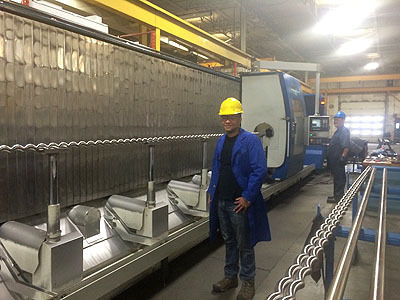 Leistritz machine tools are commissioned at the customer’s site. Our service technicians accompany the customers during the first production run to ensure a smooth and safe start. Regular maintenance and anti-wear measures save a lot of time and money, as well as prevent unplanned production stoppages. Our team of highly trained service technicians can service your Leistritz Machine anywhere in the world and help ensure long machine life and reduced downtime.